I went to elementary school in Edgewood Maryland at Deerfield Elementary School. My most vivid memory there was a Nature Activity we did every winter right before Spring. We work on preparing pine cones for the birds by covering them with goodies to hang on the large pine trees outside our class windows. The big fire engine would come and some lucky children were chosen to help hang their pine cones at the very top of the tree with help from the fireman. I decided to reminisce and make them with my daughters. When I told Abby that their might be some little birdies outside that were having a hard time finding food she was very upset and wanted to help! 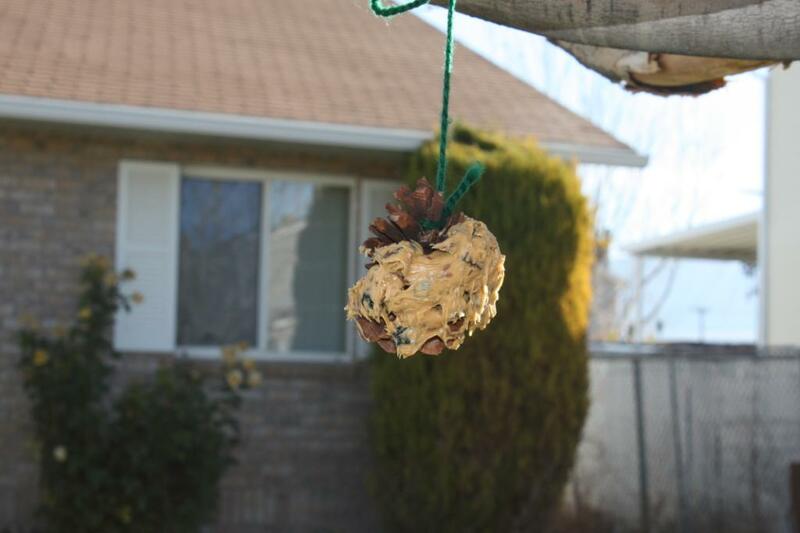 We simply took a container of almost gone peanut butter, added in some seeds and nuts and it spread it on the pine cone. We hung it on the trees in our front yard along with some orange slices placed on the branches. It branched off into a discussion about birds, trees and was a very peaceful afternoon. « Now Hear This: Mommy Says No!